1964 182 SID Survey (Part 1) | Tennessee Aircraft Services, Inc. In an effort to ensure the continued safety of our aging fleet of aluminum airplanes, Cessna has been creating Special Inspection Documents (SID). SIDs are a little bit like Service Bulletins except they are all part of a focused approach to the single objective. There has been much concern about the cost to comply with all these extra inspections, so we’re going to explore compliance with all the SIDs on a fairly typical 1964 182.The SIDs are published as Section 2A in the 100 series Maintenance Manual. To follow the entire program as described in the manual is a fairly daunting task. A fairly complicated spreadsheet would need to be generated to follow all the various due times. It’s safe to say none of our legacy Cessna’s have this many recurring FAA Airworthiness Directives to track.Section 2A starts with time limits for the inspection program. This includes determining whether the plane has a history of severe or normal usage and severe or normal corrosion environment exposure. Of course, unless you’ve owned that forty-eight year old 182 since it was new, you have no way to know how or where it was used. Then there are the inspection interval explanations that break the SID calendar time and hourly time intervals into thirty- one separate operations. It’s daunting just to read through it, and we haven’t even found the first actual SID yet. I suspect very few “N” registered airplane owners will go through the effort to follow all the elaborate scheduling of the SIDs. Most will realize that all the SIDs are first due within twenty years of the date of the aircrafts’ manufacture date. Since that puts us a couple of decades past due, Cessna decided all compliance could wait a year or so. This is a simple inspection once access to the torque tubes is gained. It’s just a detailed look at all the welds, attach points, and tubes for any sort of failure. It’s unfortunate the fleet has shown enough faults and failure of these components that Cessna had reason to generate an SID. Of course, it doesn’t help that a failure of this very part was caught on camera for all to see on an episode of Flying Wild Alaska. 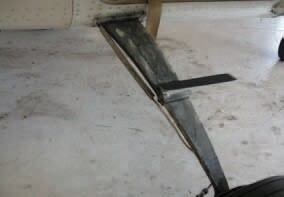 The problem is that rudder pedal torque tube inspection should be part of any proper annual inspection. Had mechanics been doing good inspections, the failure rate would have been much smaller and may have not made it on Cessna’s RADAR. The actual inspection only takes a few minutes and takes virtually no extra time if noted during a proper annual inspection. 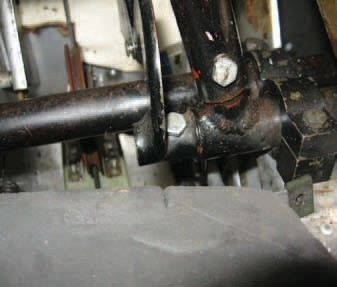 As you can see, most of the rudder pedal torque tube system is pretty easy to get to. Notice the corrosion on the retaining block at the left of the picture. The torque tubes are non-heat treated steel, so repairs are made by typical welding and well covered in the service manual and FAA AC 43.13-1B change 1. 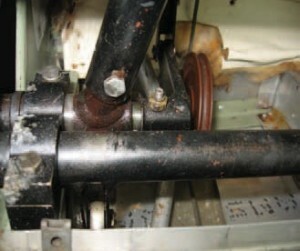 The reddish color on the black steel tube below the pedal attachment is an indication of rust. The most likely suspect is the pedal attachment bolt. While you’re looking around, absolutely take an extra 30 seconds and inspect the mounting brackets and short bulkhead that the pilot’s left brake master cylinder mounts to. These are prone to deformation and cracking. I suspect the mount was designed with lighter weight pilots in mind. While you’re in the area, be sure to check the mounting bracket for the pilot’s left brake master cylinder. These are very prone to deformation and cracking. This is another easy inspection that is only visual with the aid of a 4X magnifier. While all the seats and floor inspection panels are removed for an annual, this only takes an extra hour or so. 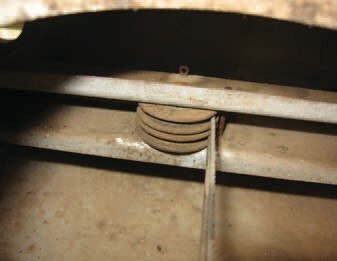 I especially like this SID because it forces one to access pulleys and brackets that are often ignored during inspection. In addition to the inspections called for in the SID, be sure to lubricate the pulley bearings and the cables in the area around the pulley. These two elevator trim actuator pulleys are located in the middle of the horizontal stabilizer directly below the vertical fin. These two had not be lubricated in many years and were locked up. The cables should also be lubricated. 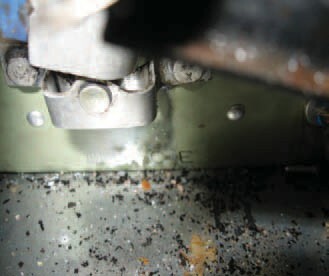 A note on this SID calls for its compliance to coincide with overhaul of the trim tab actuator. Of course, that overhaul is not mandatory for FAR Part 91 aircraft, but if you’re compelled to do the SID, you’re probably also compelled to do the 1000 hour trim actuator overhaul. 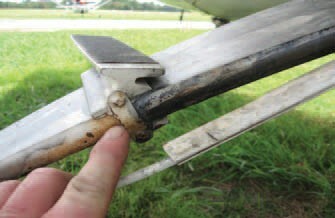 The trim actuator, mounted in the right horizontal stabilizer, looks like it’s not seen the eyes of an inspector in quite a while. 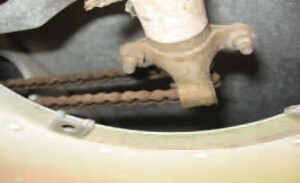 The chain is dry and rusted and the actuator is probably in the same condition. This is the first SID with no hourly compliance time, which is fitting since corrosion growth on the steel parts is almost totally a function of calendar time and environment. 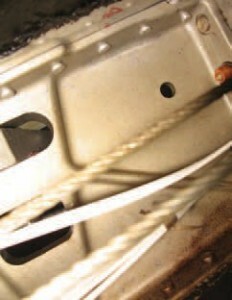 It also refers one to section 2A- 30-01 for more detail on corrosion. The gear legs are constructed of a heavy flat spring steel which is shot peened on their lower surface to enhance the fatigue life of the part. There have been instances of these legs failing, possibly as a result of previous use of certain paint removing chemicals. You might notice the SID only calls for rust and paint removal by sanding. One would think a little rust won’t hurt a slab of steel that thick, but it only takes a small imperfection to destroy the structure integrity when the right forces are applied. The old spring steel gear. It looks pretty indestructible but it does have its Kriptonite. Anywhere something is attached to the gear leg is a like spot for rust. 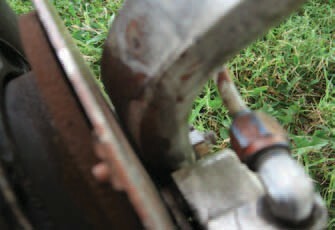 Rust on the lower end of the leg at the axle attach area. We often think of primers as the medium that holds the decorative paint in place. The fact is that proper application of primer and paints can dramatically enhance the life expectancy of the part. While we’re looking at the gear legs, we should continue into the belly of the plane and check out the leg mounting structure. There are a total of four large forged aluminum fittings sandwiched between a fore and aft bulkhead which make up an assembly that’s often called the gearbox. 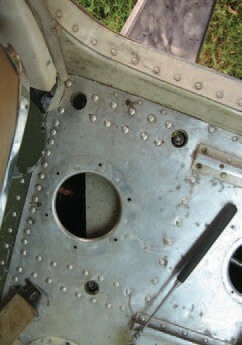 Looking down at the floor where the gear leg mounts and the aluminum forgings are hiding. The gearbox is made up of various metals including at least three different aluminum alloys (including the rivets), spring steel gear legs, and various plated steel fasteners. It’s amazing such a light weight assembly can withstand the stress of some of the landings (some more accurately described as impacts). One can imagine how important it is to ensure all the components are maintained at full structural capacity. This simple visual inspection is an easy way to make sure the gear stays properly attached. A look at one of the forgings. This inspection can easily be completed anytime a main wheel is removed for a tire change or wheel bearing service. Once the wheel is off, it’s just a simple visual inspection of the axle. If no sign of cracks are noted, the wheel just gets put back on. However, if there is any suspicion of a crack, then things can get complicated. This is the first SID in our list that potentially could need special eddy current equipment for the inspection. Eddy current inspection requires special equipment and personnel specifically trained and certified to use it. Few small shops have anyone on staff qualified to do these eddy current inspections, much less have the equipment. The truth is, one could probably replace any compromised axle with a serviceable unit from a salvage yard. Swapping an axle is a pretty straight forward part replacement. Obtaining a used axle and installing it is probably going to be far less expensive than hiring an out of town contractor to do an eddy current check. This concept will come up again in other SIDs. The labor time listed under the header of each SID discussion are approximate times expected if they are performed outside of an annual inspection event. The time is what one might expect a shop to charge including removal of whatever upholstery or access panels are needed and put them all back on. If performed during the normal course of an annual or 100 hour inspection, the labor time is almost nominal. Looking or not looking won’t change the condition of the plane. The consequences of not looking are a significant safety concern. It only makes common sense to find structural problems during routine inspections instead of a routine investigation. There have been those that point to these new SIDs as Cessna’s attempt to accelerate the demise of our legacy airframes. It is true that the first overview of the new section 2A is a bit overwhelming. After one fully unpacks all the complicated inspection operation schedules and base line corrosion inspections, it should become obvious that this entire program is intended to keep these planes safe for a long time to come.